The time has finally arrived for which many people waited long. The demand for bringing Priyanka Gandhi (47) on active politics was not only raised outside the party but also within the party. It has been believed for a long time that Sonia Gandhi was not in favour of bringing Priyanka Gandhi into politics. But by the announcement of making her the General Secretary, the party gave the indication that it does not want to leave any chance of challenging Modi. Now that she has formally entered the active politics ahead of the general elections, speculations are being made as to whether her entry into politics will be a game changer for Congress? Praising sister Priyanka, Rahul said that she is capable of assisting him in the coming Lok Sabha Election in Uttar Pradesh. The statement of Rahul Gandhi, ”We will play on the front foot, not backfoot” shows his confidence in his sister and that this is a well-thought decision. Will the gamble work for the Congress? There is no doubt that Priyanka is a brilliant orator and bears a popular image particularly among women and youth of this country. Congress has tried to show its strength in the form of Priyanka. It is a move by Congress to safeguard the image of Rahul which was destroyed by BJP. ‘Priyanka Laao Desh Bachao’ was the slogan given by one segment within the Congress. In this move, Congress has tried to revitalize and strengthen the morale of the workers, who have to root for her for long and those who have faced repeated defeats in Uttar Pradesh Elections. In terms of an organisation, it can be called a smart move but dreaming that it will change the whole equation of the upcoming Lok Sabha Election would be too early to expect. Priyanka Gandhi has a strong influence over the Brahmans as they see the shadows of Indira Gandhi in her and sympathises with her. Calling this move as a masterstroke is nothing but an exaggeration. There are many other dynamics and complexities that are needed to be analysed carefully. It is said that Uttar Pradesh politics does not happen on the issues of development but based on caste. According to this narrative, the politics of Yadav and Dalit votes is more communal, the evidence can be seen from the 2017 Assembly Elections. Despite all the efforts of Rahul and Akhilesh to portray themselves as the sons of Uttar Pradesh, they lost it badly. Congress fought for 105 seats and managed to secure only 7 seats. Therefore, Congress is not entering the Mahagathbandhan this time, as it knows that the Dalits and Yadavs are not going to vote Congress in any way. Not just Dalits and Yadavs will not vote for them but if it enters Mahagathbandhan, even the upper caste will also go out of their hands which were the vote bank of Congress. On the other hand, Mahagathbandhan understands this equation of upper caste and lower caste very keenly. SP and BSP understand the situation in which hypothetically if they took Congress with them and contest election together, then on the seats where the Congress would not have a candidate, the Brahmin and other upper caste votes would fall in the hands of BJP which would have been a loss for Mahagathban too. Therefore, they know that there is not much benefit to them from allying with the Congress and it would not transfer votes to them. Congress secured 21 seats in the 2009 Lok Sabha Elections. Most of these seats belonged to the eastern Uttar Pradesh, particularly from the Awadh region. The Brahmin, non Jatav Dalits, Kurmis and Muslims caste equation ensured the win of Congress in these regions. Party wants to get back the same equation in this election. What does this mean for PM Modi and the BJP? considered to be the backyard of Prime Minister Modi and Uttar Pradesh CM Yogi, which will definitely add to the tensions of the both Modi and Yogi. At a time when the Congress already has Rajasthan, Madhya Pradesh and Chhattisgarh under its belt, the entry of Priyanka Gandhi will only add to their hope. 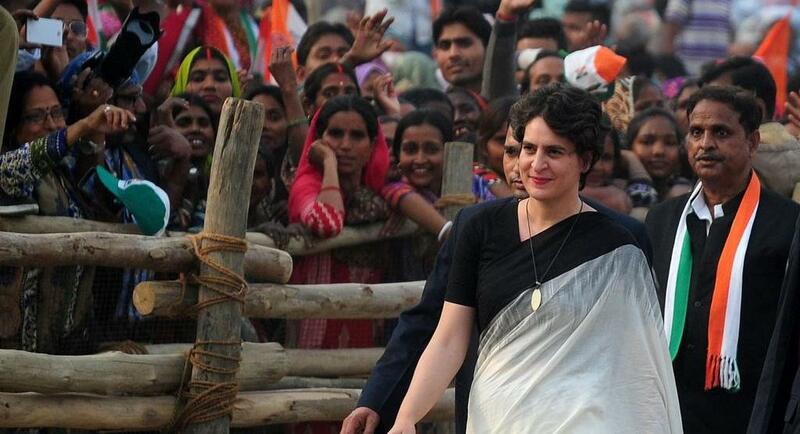 She has an appealing and charismatic personality which is why Congress has a lot of confidence in Priyanka and there is no doubt that Priyanka Gandhi will change the dynamics of Uttar Pradesh. Many pictures of her on social media depict her as a woman who is simple, easily accessible and the masses can connect to her. Apart from this, she is excellent at responding to her critiques and counter-arguing. It will be interesting to note how effective her role will be in the upcoming election and whether her effects will change the dynamics of national politics or not. The voters are the best to decide.